More information: This time the band put the focus on rhythmic sophistication innovation in the field of sound design to deliver even more vital imagery for the imagination of people. Dreamy, melancholic, cinematic, prog! It would have been easy to get fully immersed in melancholia, but despite the enormous emotionality of the songs in many places subtle winks provide them with moments of lightness and comfort. 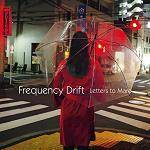 Frequency Drift has never been rhythmically more versatile, never have the songs contained more energy or heart.